In a medium pot, put 3 or 4 good glugs of extra-virgin olive oil (about 2 tablespoons) over medium heat. Add 3 to 4 smashed garlic cloves to perfume the oil. When the garlic is golden brown, add one finely chopped small yellow onion and allow it to sweat down until browned, about 5 to 6 minutes. Drain and reserve the juices of 2 small cans (15 ounces each) or one big can (35 ounces) of whole tomatoes, and smush the tomatoes with your fingers in a bowl. Watch out, they squirt. Add tomatoes to pot. Simmer over medium-low heat, stirring occasionally. Add a small amount of reserved tomato juice to thin if necessary. Let simmer for 30 to 40 minutes. Taste. If the tomatoes are too acidic, add sugar, 1/2 teaspoon at a time, until the flavor mellows. Add salt to taste. (And red pepper flakes if you’re feeling spicy.) Fish out garlic cloves (or leave in for real punch). Remove from heat. Tear a handful of basil and toss it into the pot. Most importantly, when serving with pasta, make sure you heat only just enough sauce over medium heat with a smidge of olive oil in a pan or a pot. (For about a pound of pasta, 2 good ladlefuls should do.) Add hot, drained pasta directly to the sauce. 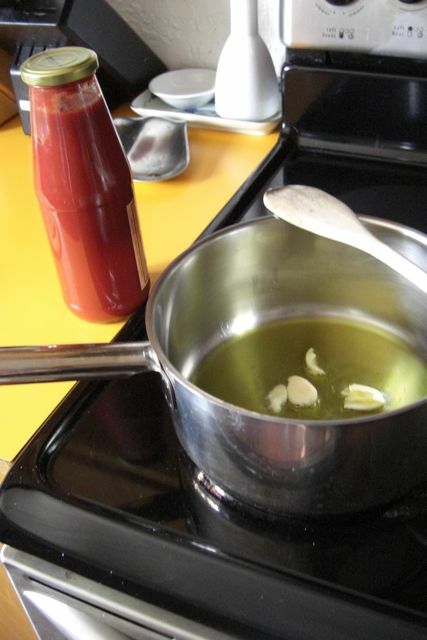 Toss the pasta over the heat with the sauce, allowing the sauce to cook into the pasta. There shouldn’t be too much sauce — it should just coat the pasta, not overwhelm it. Pour into serving dish. 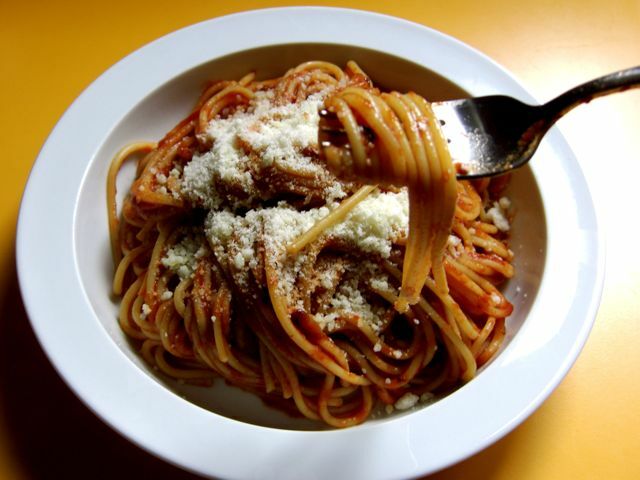 Garnish with a drizzle of extra-virgin olive oil and grated fresh Parmesan cheese. Even for my parents, new to American culture, spaghetti and meatballs held a symbolic place in the pantheon of American cuisine. They changed it, modified it, made it their own, but we still had spaghetti and meatballs. To this day, I have that taste on the back of my tongue. Even when I have been offered more Italian-American-tasting spaghetti and meatballs, even when I have tasted more sophisticated plates with homemade pasta and organic ground beef and herbs picked right from the garden — well, I recognize they might be better for you, I recognize they might be more authentic, but still I long for my mom’s tangy sweet sauce, my dad’s dim-sum-tasting meatballs, and that feeling that only home can bring. When I met my husband, born and raised in Milan — who immigrated here for me — I made spaghetti and meatballs. Surely all Italians must love spaghetti and meatballs. And I wanted to make him feel at home in this newly adopted country of his. “Mmmm,” he said, with a funny look on his face. “This kind of what?” I asked. I laughed out loud at his confusion and his seriousness. My poor husband truly was perplexed. And that was the last time I made him spaghetti and meatballs. Spaghetti with tomato sauce, well, that’s a different story. That’s a staple in our house. And not just any tomato sauce, but his own mother’s tomato sauce, the sauce that was taught to her by her own Sicilian mother-in-law, that was taught to her by her own mother, that was taught to her by her own mother, etc., etc., and on down the line. Every time I make Stefano and his father pasta with tomato sauce, they sigh, lean back, and say, “Si, é il sugo della mamma.”  And then Stefano’s father adds, “You know, my mother taught her how to make the sauce.” Then they smile, nostalgically. And I smile knowingly, because it is and it’s not. There’s a gendered myth in Italy that every mother in Italy makes the best tomato sauce. Every sauce is a bit different: garlic, no onions; onions, no garlic; basil; oregano; fresh tomatoes; canned tomatoes; broth; bouillon; stock; chunky; smooth. And they all taste different. And the mothers hush their children, tell them to finish their plates, and smile a bit behind their napkins. I have seen my own husband, a grown man, do this. “Good, no?” I’ll ask, seated in the Italian restaurant. “It’s OK,” he’ll reply. “It’s not like my mom’s.” (This has now been changed to “It’s not like yours” due to some tears, anguish, and insecurity on the part of this cook.) And the myth continues that every Italian bride struggles with the “It’s not like my mother’s” aria that is sung night after night at the dinner table. And that the mothers, even from afar, seated in their own homes, smile a little Cheshire-cat smile into their napkins. Tomato sauce is the marker of home, a symbol of love, a tradition of time. It is the connection between the present and the past — and depending on the family and how many grandmothers and great-grandmothers passed on the family recipe, the past past past. It is the taste that is always on the back of your tongue. Now, being a little ornery and contrary, I do not make my mother-in-law’s sauce exactly the way my mother-in-law makes it. But I am guessing that my mother-in-law, herself a bit of a rebel and tenacious to match, did not make her mother-in-law’s sauce exactly the way her mother-in-law made it. And I’m sure there are a few cantankerous D’Amico women in the distant past who defiantly added pepper or a brush of thyme or stirred counterclockwise. What is important is that each generation believes that that sauce, whatever variations there may be, belongs to them. And even though I suffered a bit under the shadow of my mother-in-law’s sauce, when my own son wanders up to me and whispers loudly in my ear (we have to work on that), “It doesn’t taste right,” I shush him, tell him to finish his dinner, and smile, just a little bit, behind my napkin.